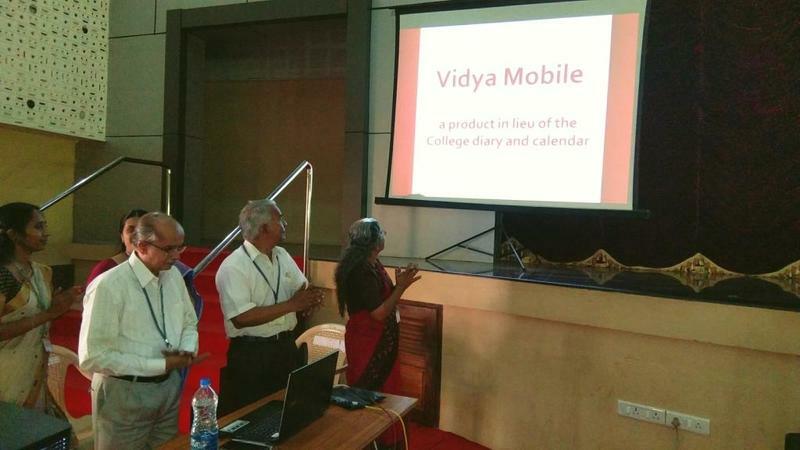 “Vidya Mobile”, an Android app developed in house by the MCA Department, was officially launched in a function held in the Auditorium on 24.11.2017. VICT and the College authorities have approved the app as an official information app of the College and it has also been approved as a product in lieu of the College Calendar & Diary. Accordingly, no print version of the Calendar & Diary of the current academic year has been made available to students and staff of the College. The app was officially launched by Er. G Mohanachandran, Executive Director, VICT, in the presence of the Principal, Heads of Departments, faculty and staff, and a representative set of B Tech and M Tech students. All students, faculty and staff of the MCA Department participated in the programme. Dr V N Krishnachandran, Head of MCA Department, made a presentation on the contents of the app. Vidya Academy of Science & Technology is the first and the only institution of higher education in Kerala (probably in India) to have such a comprehensive mobile app.